Meetings are a powerful tool that teams can utilize to solicit feedback, promote collaboration and enhance communication among its participants. Far too often, you see managers and organizers making meetings that are not as effective or efficient as they could be. Let’s discuss how to create a productive meeting and identify some of the common mistakes meeting organizers make. The first step to a great meeting is to identify the purpose of the meeting. Seems simple, right? In some ways it is, but it is easy to come up with objectives that will set you up for failure. Analysis – Face to face meetings are a great way to analyze a complex topic and get people on the same page. If you are pulling in experts in different areas (such as a client and a programmer), steps should be taken to ensure that differences in vocabulary are accounted for so that everyone remains on the same page.Assignments – Assigning tasks to participants are a great use of meetings especially if your team is tackling a project with a broad scope. By assigning tasks during your meeting, you can ensure that everyone is aware of what needs to get done as a whole as well as keeping everyone informed of individual team member assignments. Idea Generation – The reason why brainstorming and idea generation works so well in meetings is because they allow for a bit of back and forth. It also allows team members to build upon the ideas of others. One tip for making this successful is to share the problem beforehand to give participants some time to formulate solutions to the problem you are facing. Relationship Building – Sometimes meetings are used to build and repair relationships. Sitting people down and having them work through a problem can be healthy for the work environment. Decision Making – Similar to the analysis purpose above, a meeting is a great place to look at the available information about a problem/direction and make a decision. Information Exchange – Despite being a terrible reason for a meeting, this is often the most common reason organizations hold meetings. If this is your purpose, consider whether an email, memo or even phone call might be a better way to disseminate the information rather than a face-to-face meeting. Persuasion – If the sole purpose of your meeting is to persuade others to change their behavior then you should consider moving that to an outlet outside of the meeting. Doing so will usually result in a better outcome. Once you know when you’re going to meet you need to set the agenda of topics for the meeting. There are a few rules to scheduling a meeting that you should try to follow. Limit Invites – Try to avoid inviting those to a meeting unless their presence is critical to the success of the meeting. Limiting invites keeps the meeting size small, which helps it stay on track. It also prevents wasting valuable time of those who won’t likely contribute much, or get much from, the meeting itself. Often soliciting input before, and providing the minutes after, are a more efficient use of time. Be sure to send the invited participants a calendar invite using Outlook or Google Calendar or some other scheduling tool of your choice. Keep it Short – Meeting length is often the most common pain point expressed by meeting participants. There are varying schools of thoughts as to the optimal duration of a meeting, but most would say the optimal meeting length is in the fifteen minutes to half hour range. With an attention span of 10-18 minutes, humans struggle to maintain a high level of focus for long periods of time. It’s better to hold more focused, shorter meetings rather than one large one. The purpose of the meeting agenda is to set out an outline as to what will be covered during the meeting. A number of things help make meeting agendas effective, here are some of the most important ones. There aren’t a lot of strict and fast rules when it comes to an agenda format, but most do use an outline format. It is important to ensure each item specifies who is presenting that item and how much time they have. Doing so helps add accountability to ensure the meeting progresses on time. To give an example of this I will use one of our clients, CurlTroy, as an example. Here is one of their agenda items from a meeting they recently held (used with permission). 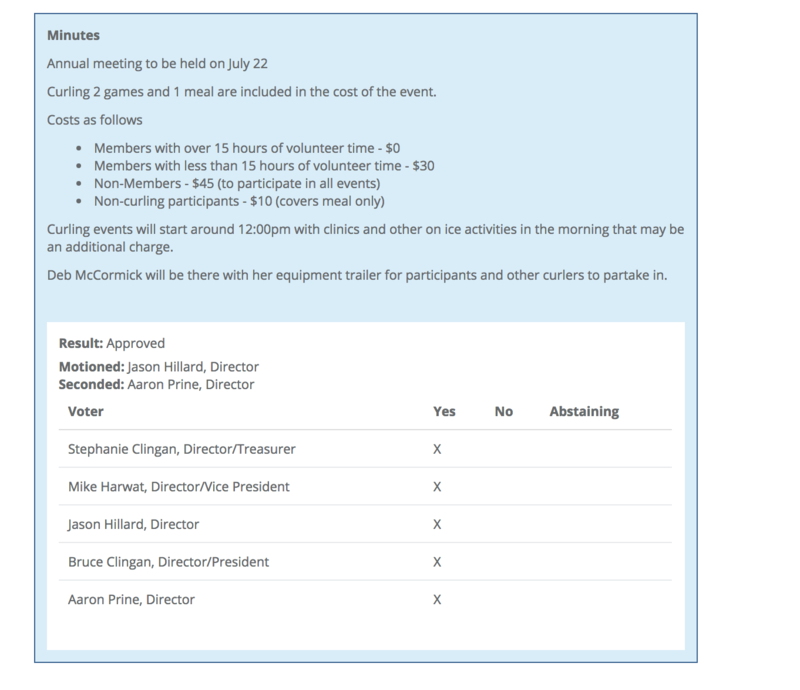 An example of how a meeting agenda item looks in BlueSky. Image used with permission. If you are a member of a board meeting group, consider what types of agenda items would be most effective for you. For example, using a consent agenda item could save you a lot of time as it allows you to vote on multiple items at once versus doing so individually. Meetings are by their nature are collaborative. If it fits the purpose of the meeting, soliciting feedback can be a great way to get team members engaged. Additionally, you may want to provide a method for participants to suggest items and provide some transparency into how those suggestions make it onto the agenda. Once you have your agenda finalized, it is crucial that you distribute it with enough time that each member can review it and formulate their thoughts on each item, ideally a few days before. In BlueSky we handle this by automatically emailing a copy of your meeting agenda to your participants once it has been finalized. 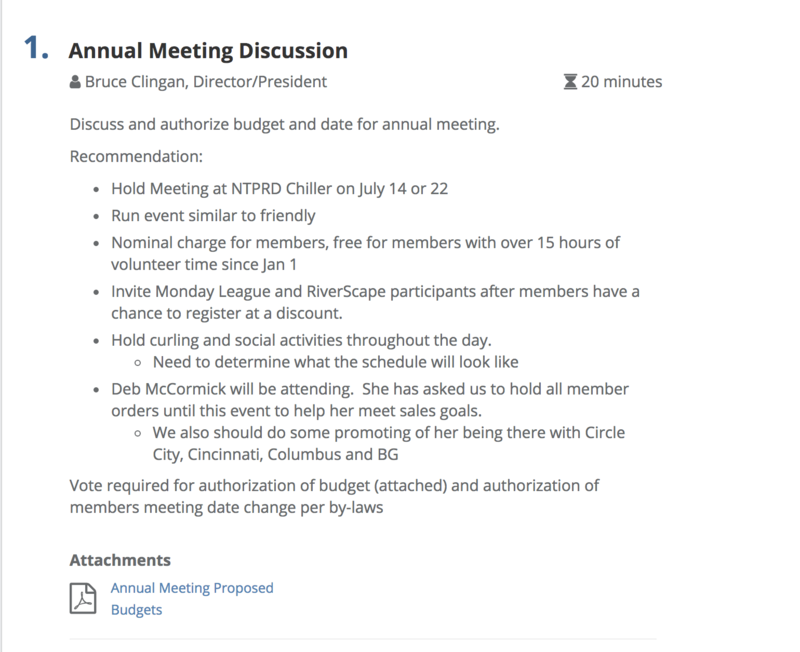 You may also want to consider adding an item to your agenda to “Changes to the Agenda.” If something comes up in between the time the agenda was finalized and the start of the meeting, this is a great way to address any last minute changes. Note this may not be possible if you are holding a more formal style of meeting, such as a Board Meeting. One last tip regarding distributing the agenda is to send it out in PDF format versus a Word document or another format. A PDF can be easily read by someone on their mobile device and is useful for those members who are frequently on the go. When the time comes to start your meeting, it is important that you start, and end your meeting on time. Your job as the meeting organizer is to help guide it through the agenda and ensure that things stay on track. It is often a balancing act between encouraging discussion and not prolonging the meeting. You may want to set a timer if you have an item that you feel could get particularly long-winded. As your team works through each item in the meeting agenda, you will want to ensure good meeting minutes are taken. Someone present at the meeting should be given the responsibility of taking minutes and notes during the meeting. If good minutes have to be kept on record make sure you have a process for your team members to approve those minutes and their accuracy. Meeting minutes are your documentation for everything that occurred during the meeting. If you are not regularly taking meeting minutes, it is encouraged that you do so that you can have a record to refer back to in the future. Meeting minutes also provide transparency for those that were not invited to the meeting and a record for those that may have been absent. So what should you include in your meeting minutes? Attendance – You’ll want to write down who was in attendance at the meeting as well as who was unable to attend. Decisions – Make a note of any decisions that were made such as budgetary decisions or Plan of Actions. Also, if your meeting team votes, you will want to make a note of which members voted in favor of, against or abstained. A table format is a great way to display this information. Document Discussion – If a particular item spurred any discussion you might want to document the main arguments as it can provide some valuable insight into how the meeting team arrived at a decision. Photos – If one of your members uses a whiteboard or other medium for illustrating a concept, a picture is a great way to document it. Doing so saves you the hassle of having to transcribe a visual item into your meeting minutes. It is generally encouraged that the minutes are written during the meeting on an item-by-item basis or as soon as the meeting is over. 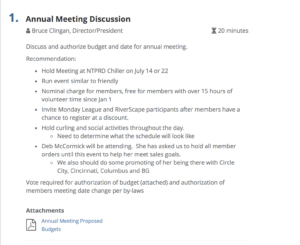 To illustrate an example, here is a screenshot of the meeting minutes that CurlTroy took for the same item I showed above. An example of how meeting minutes look to the public in BlueSky. Image used with permission. Once the meeting has concluded it is a good idea that you take some time to review your minutes, finalize any changes and then distribute those minutes to the meeting participants. 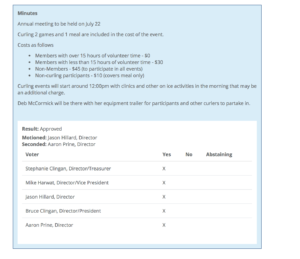 This serves as a written record of the decisions that were made during the meeting and provides something that participants and organizers can refer back to in the future. If possible, you should send out the minutes within 1-3 days after the end of the meeting and no later than the start of the next meeting. You may want to develop a process where meeting participants can suggest alterations to the minutes, sometimes it’s easy to miss items or make mistakes in your own note taking. It is also a good idea to periodically follow up with your meeting participants and ask them how they felt the meeting went and what improvements could be made. Just following some simple steps can help make your meeting more effective and enjoyable. Do you have any suggestions for increasing meeting effectiveness? Leave a comment below and let us know!